The man certainly has a way with words – a true poet. I guess we are supposed to be alarmed because 187 feet per year is a lot faster than 1.25 miles per 200 years. After all, 1.25 miles in 200 years averages out to only 33 feet per year. The message we are supposed to get is that the Exit Glacier is receding about 6 times faster now than its average over the last 200 years. This, of course, is due to the CO2 that vile humans use to poison the atmosphere and it means endless and escalating disaster unless we socialize the economy of the world. But what does the National Park service say about the retreat rate of Exit Glacier? The following table of retreat distances and rates comes from the National Park Service’s “The Retreat of Exit Glacier.” Annotation in red was added by me. 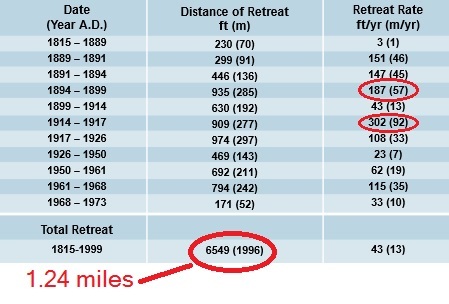 So, this data confirms Obama’s assertion that the Exit Glacier has retreated 1.25 miles in the last 200 years. But it also makes it quite clear that it was retreating as fast, or faster, 100 years ago. If CO2 is the culprit today, what was the culprit 100 years ago? The following graph shows the amount of anthropogenic CO2 in the atmosphere as a function of time going back to 1750. The data comes from Oak Ridge National Laboratory. I made the plot and added the annotation. It’s kind of hard to explain why the retreat rate was so much greater in the past when there was less than 10% of the anthropogenic atmospheric CO2 than there is today. Perhaps Professor Obama will elucidate. My wife and I were up in Alaska a few years ago, and we also visited some some of those receding glaciers. 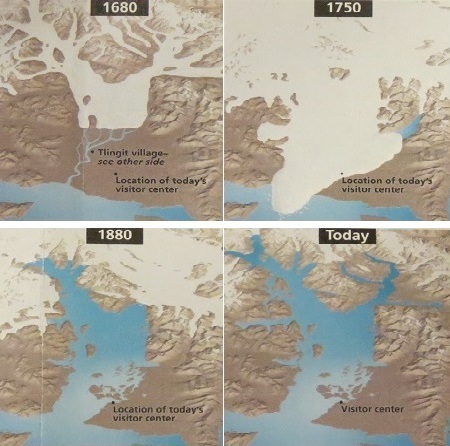 At Glacier Bay National Park, which is several hundred miles southeast of Exit Glacier, I happened to pick up a park pamphlet that had the following series of illustrations showing the glacier extents in the park going back to 1680. As an aside, a co-worker once told me that the Little Ice Age was not a global phenomenon, but rather, local to Europe. He cited the Union of Concerned Scientists as the source of this insight. But there it is, in Alaska! 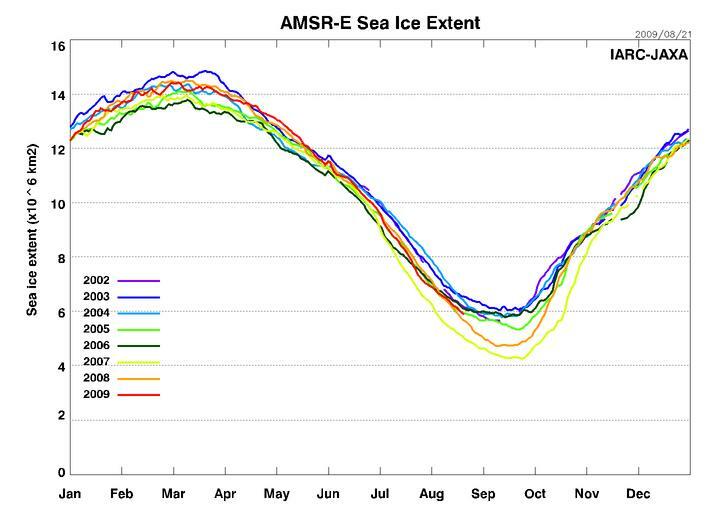 It is hard to argue with the Union of Concerned Scientists because they’re, well, scientists. Not just anybody can be a Concerned Scientist. You have to send a check first. My wife used to send a check years ago, but it was from our joint account so I figure I was only half a Concerned Scientist then. Now I guess I am just a wholly unconcerned scientist. I have plotted the distance as a function of time for three glacier routes using this crude method. As you can see below, these glaciers have receded at a much faster rate than Exit Glacier. But Exit Glacier and the Glacier Bay National Park glaciers have one thing common: they all retreated at their maximum rate back when anthropogenic atmospheric CO2 levels were very low compared to today. Let’s take a closer look at the Grand Pacific Glacier. John J. Clague and S. G. Evans (J. of Glaciology) used various data sources to plot the retreat of the Grand Pacific Glacier. I have converted their data to miles and overlaid it with my coarser data from the map. The Clague data and the map data agree nicely, but the Clague data fills in some of the gaps. 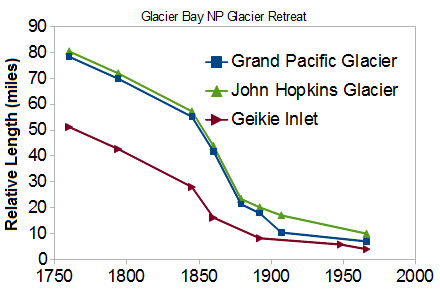 The most interesting point is that like Exit Glacier, the retreat rate for the Grand Pacific Glacier was greatest around the last part of the 19th century. 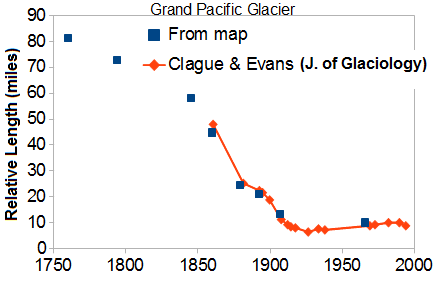 In fact, the Clague data may indicate that the Grand Pacific Glacier was slightly progressing, not retreating, during most of the 20th century. 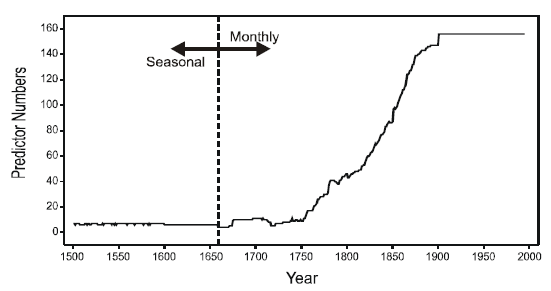 It is pretty clear that the Grand Pacific Glacier was retreating fastest around 1860. 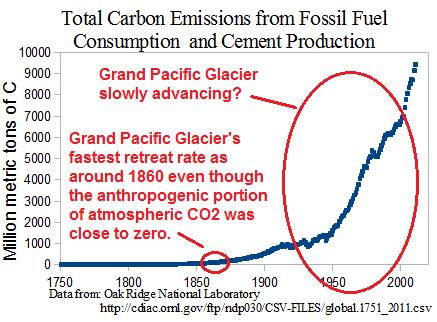 Where is that on the anthropogenic atmospheric CO2 timeline? The graph below shows that the anthropogenic atmospheric CO2 level was only about 2% of today’s level when the Grand Pacific Glacier was retreating at its fastest by far! How is that possible??????? I thought it was high CO2 levels that caused the glaciers to recede. The Guardian: “China is slowing its carbon emissions.” Huh? Left-wingers in the US have a need to see everything European as superior to American. But it may be a necessity of left-wingers in general see some other culture as preferable to their own. So if you are a European left-winger, who do you look up to? Certainly not the United States! That’s what China is for! So a few days ago Jennifer Duggan, in her Guardian column said “China’s action on air pollution is slowing its carbon emissions.” Maybe Duggan doesn’t know the difference between first and second derivatives and meant to say “China is reducing its acceleration of carbon emissions,” but even that wouldn’t be true. The latest Climate Change Performance Index published by Germanwatch and Climate Action Network Europe suggests that China is taking action to clean up its act as it tries to deal with its hazardously high levels of air pollution. OK, sure, “slower growth of CO2 emissions.” Whatever you say Jennifer. There is rhetoric – and there is reality. Here is some reality. BEIJING — China’s coal consumption is expected to hit 4.8 billion metric tons by 2020, the China National Coal Association (CNCA) forecast on Sunday. CNCA data showed that China’s coal output increased to 3.65 billion tons last year from 2.35 billion tons in 2005, representing an annual increase of 190 million tons. Consumption in 2012 stood at 3.52 billion tons. So, going from 3.65 billion tons this year to 4.8 billion tons in 2020 represents neither a decrease in usage (first derivative) nor a decrease in the rate of increase (second derivative). 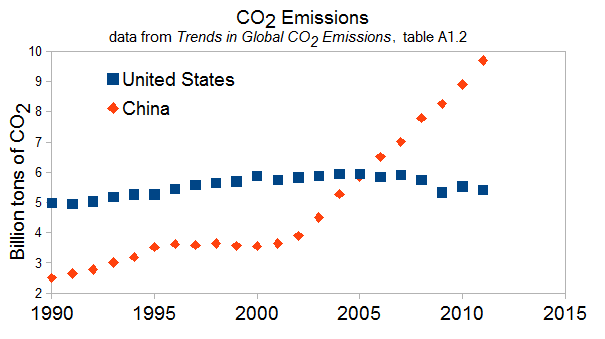 By the way, how does Chinese emission acceleration compare to US emissions acceleration? China’s five-year plan ending in 2015 envisions adding 520 GW to its current power production, expanding its capacity by 54%. Coal will be the primary source of energy in this increase…Coal-fired plants will contribute 58% of the increase in 2015 to remain the largest contributor to China’s power generation. The United Stages’ Energy Information Administration’s evaluation of China’s energy consumption (2012) shows us the breakdown of the fuel types for China’s electricity production for the last two decades. Do you see the difference in trends for “Total Fossil Fuels” and “Other Renewables?” You may need a magnifying glass to see it. Air Pollution is out of control in China. There is no doubt that simply breathing in many Chinese cities can be hazardous to your health. But CO2 is not the source of that hazard – it is other gasses and particulates that are destroying people’s lungs. There is also no doubt that China will continue full-bore toward energy-consuming industrialization. I expect that improvement (if any) in Chinese air quality in the near future will come in the form of particulate removal. 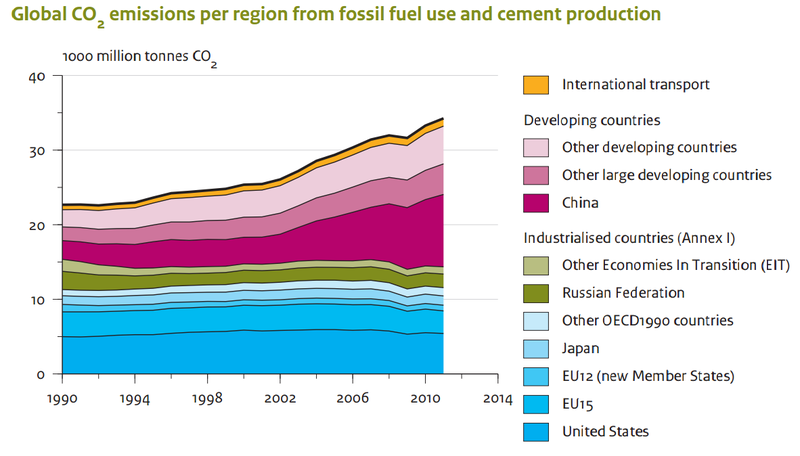 But CO2 emissions will grow and grow and grow in China. Step 1. Gather time series. Step 2. 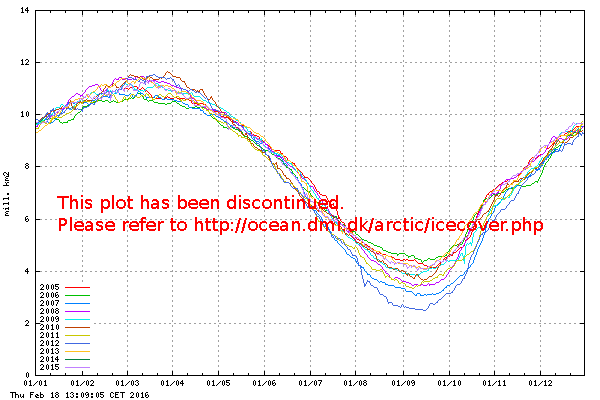 Select those time series that fit the instrumental (measured) temperature record of choice. Assume that since these time series match the measured temperature in some way, then they are, in fact, temperature proxies. Step 3. Combine the chosen proxies in some fashion and note, not surprisingly, that the combined proxies match the temperature record. (duh) Call this your temperature reconstruction. Step 4. Call this thing made from the combined proxies your temperature reconstruction, and therefore assume that the combined proxies are also a match for the temperature that occurred prior to the temperature measurement records. Step 5. Note that the reconstruction shows that the temperature prior to the instrumental data is relatively flat, and conclude that the temperature prior to the instrumental record changed very little. 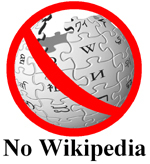 We made use of a multiple proxy (‘‘multiproxy’’) database consisting of a diverse (1,209) set of annually(1,158) and decadally (51) resolved proxy series … including tree-ring, marine sediment, speleothem, lacustrine, ice core, coral, and historical documentary series. All 1,209 series were available back to at least A.D. 1800, 460 extend back to A.D. 1600, 177 back to A.D. 1400, 59 back to A.D. 1000, 36 back to A.D. 500, and 25 back to year ‘‘0’’ (i.e., 1 B.C.). Mann split his analysis between the Northern and Southern hemispheres. I am going to talk about the 1,036 of the 1,209 proxies that applied to the North. The following two images show the plots of the these 1,036 proxies, just click on them to enlarge. The file sizes are less than a megabyte each and should open quickly in your browser. Figure 1 is the plots arranged in alphabetical order. If you scroll through this image you will see a lot of proxies that don’t look much like a hockey stick, and a few scattered here and there that do. However, there is a series of 71 proxies named lutannt1 through lutannt71 that look very much like hockey sticks. Figure 2. All Northern Hemisphere proxies in order of correlation with Northern Hemisphere instrumental temperature record. As explained in the five easy steps for hockey stick construction, the proxies that look much like a hockey stick are likely to be weighted heavily in the final hockey stick construction. If all the 1,036 proxies are correlated (For the math inclined: see correlation formula below) with the northern hemisphere instrumental temperature record, and the plots laid out from the worst correlation to the best, it will look like figure 2. Scroll through this figure from top to bottom. You will see the worst correlations at the top and the best on the bottom. Note that the Luterbacher proxies are among the best correlated, and show up near the bottom. Figure 3. All Northern Hemisphere proxies, except Luterbacher proxies, in order of correlation with Northern Hemisphere instrumental temperature record. Figure 3 is the same as figure 2, but with the Luterbacher proxies removed. Scroll through, and it is quite clear that there are far fewer hockey stick-like proxies now. Remember, the point of a hockey stick is not that it goes up in the 20th century – this is a given because the hockey stick is deliberately constructed from proxies that go up in the 20th century. The real point is that it is more or less flat prior to the 20th century. (See step 5 of the super-simple steps for building a hockey stick.) The 71 Luterbacher time series are tailor-made for this purpose, because they tend to show temperature rising in the 20th century but flat prior to that. The problem with the 71 Luterbacher proxies is that they are actually not 71 separate proxies at all. 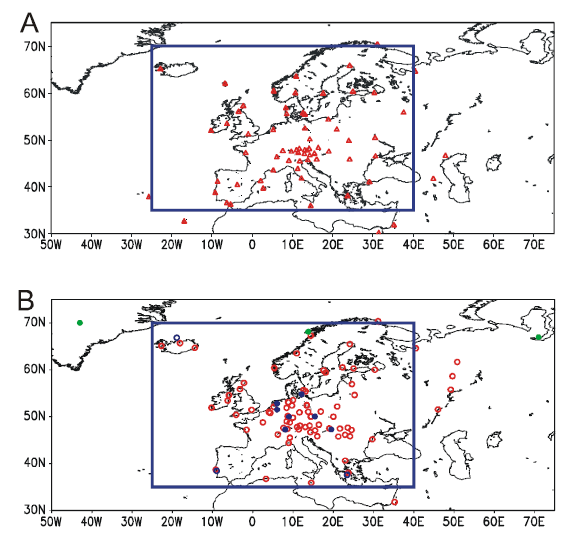 Luterbacher, et.al., (European Seasonal and Annual Temperature Variability, Trends, and Extremes Since 1500, Science, 2004) used about 150 “predictors” spread out over Europe to reconstruct European surface temperature fields. These predictors consisted of “instrumental temperature and pressure data and documentary proxy evidence.” Figure 4, taken from Luterbacher’s supplemental material, shows the geographical distribution of these predictors. Figure 4. 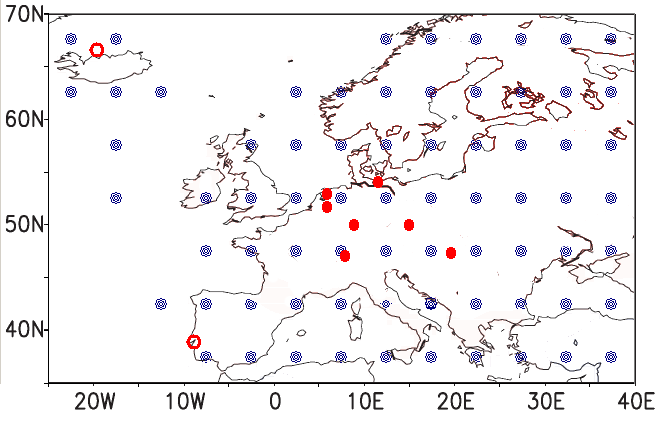 Luterbacher's original caption: (A) station pressure locations (red triangles) and surface temperature sites (B, red circles) used to reconstruct the monthly European temperature fields (25°W-40°E; 35°N-70°N given by the rectangular blue box). Blue circles indicate documentary monthly-resolved data, blue dots represent documentary information with seasonal resolution back to 1500. Green dots stand for seasonally resolved temperature proxy reconstructions from tree-ring and ice core evidence. Each of these grid points in the reconstruction is like one of the lutannt# graphs that show up in the list of proxies for Mann’s 2008 version of the hockey stick. Mann ends up with 71 lutannt# “proxies” by simply taking 71 points using 5° x 5° resolution from Luterbacher’s temperature field reconstruction. Here’s the rub: Not all the predictors used to make Luterbacher’s temprature field reconstruction go all the way back to 1500. In fact, prior to about 1760 only about 10 of the total 150 predictors are used, and these predictors are primarily “documentary information.” Prior to about 1660, only about 7 are used. Figure 5, which also comes from Luterbacher’s supplementary material, shows the number of predictors used for each year to reconstruct his surface temperature fields. Figure 5. Luterbacher's original caption: Number of predictors through time. Figure 6 shows the location of Mann’s 71 selected “proxies” and the location of the “documentary information” sources. Not the best match in the world, is it? Amazingly, the construction of some of the proxies prior to 1750 is based on data from sources over 1000 kilometers away! Figure 6. Blue dot show the location of Mann lutannt# "proxies." Red dots show the location of Luterbachers early "documentary information" sources. The important point is that all the data for Mann’s 71 lutannt# “proxies” prior to about 1760 is made up of some combination of the same 10 or so “documentary information” predictors. This short list of predictors are the “Amazing Multiplying Hockey Stick Proxies.” These 10 predictors are multiplied into 71 proxies, and these proxies all rank high for correlation to the instrumental temperature record from 1850 to the present. 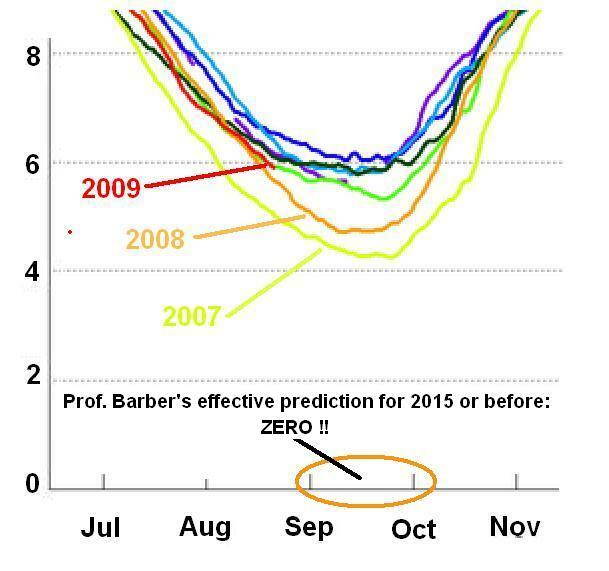 Consequently, these 71 “proxies” likely weigh heavily in Mann’s 2008 hockey stick, and these 10 “documentary information” predictors, sometimes folded into “proxies” over a thousand kilometers away, have an undeserved multiplied effect in making the flat part of the hockey stick prior to the instrumental temperature record. I recieved comment form the GM spokesman, Rob Peterson, about my last two posts lambasting the supposed 230 mile per gallon Chevy Volt. Here is Rob’s comment in its entirety. This is Rob Peterson from GM. Although the Volt has a 16 kWh battery, only 8 kWh is used. This will significantly impact the rest of your calculations and your synopsis. Please post a correction based on this fact. As for the Volt’s city fuel efficiency rating of 230mpg – this is based on the EPA’s draft methodology. The same methodology which will be used for all other vehicles of this type. I responded to Rob with two comments, which you can read here. One of those comments questions his sincerity about “blaming” the 230 mile per gallon claim on the EPA. However, he is essentially right about the the charging cycle of the 16 kWh battery only using about half of that. He has asked me to “Please post a correction based on this fact.” I have done so, but the final numbers for the vaunted Volt are still underwhelming. Here is a table comparing miles per gallon, kWh per mile, and pounds of CO2 per mile for the Chevy Volt, the Toyota Prius, and the a couple of ancient Honda Civics. You can read the details of how I derived the numbers for the Volt, using Rob’s partial capacity charge cycle scheme in the text below. Note that the prices for the Honda Civics have been adjusted for inflation to 2009 dollars for a fair comparison. Now that I have posted a correction, can I expect Rob Peterson to post a retraction of GM’s preposterous 230 mile per gallon claim? Not Likely. I have not yet been able to find an official specification for the number of kilowatt-hours per mile for the Volt. I am hoping Rob will provide one. I have found Rob’s description of the charging scheme for lithium-ion batteries to be essentially correct. That is, the battery is typically charged by the electrical grid to around 90% of total capacity. Then the car is propelled entirely off of battery power until it reaches about 30% capacity. This is known as the “charge depletion” mode. When the battery gets to about 30% of capacity the gasoline powered generator kicks in and maintains the charge at about 30% capacity. This is known as the “charge sustaining” mode. “Under the new procedure, the EPA weights plug-in electric vehicles as traveling more city miles than highway miles on only electricity. The EPA procedure would also note 25 kilowatt-hours/100 miles electrical efficiency in the city cycle. So, lets accept the value of 25 kilowatt-hours/100 miles (0.25 kWh per mile) for the moment. What is the affect that this will have on the numbers I reported for CO2 emissions? This 0.39 lbs of CO2 per mile for the Volt running on gasoline (charge sustaining mode) is the same as for the Toyota Prius, because it also gets 50 miles per gallon. Almost identical to the CO2 emitted when it is running off of gasoline (0.39 lbs of CO2 per mile). And it is also nearly identical to the amount of CO2 per mile as the much cheaperPrius generates while running off of gasoline. If we really concerned about reducing CO2 (I’m not), saving energy (I am), creating American jobs (I am), and saving money (I am), then we should support the production of an American car that is similar to a 1988 Honda Civic. Why argue the merits of a $40,000 car that few people will ever be able to afford? A $15000 dollar car that gets as good or better mileage and generates as little or less CO2 would be bought by millions and have a much greater impact. OK, so maybe the Chevy Volt doesn’t really get 230 miles per gallon. Are such exaggerations justified because they serve a greater cause? The Chevy Volt will help save the world, after all, by reducing Co2 emissions, right? When running on gasoline (known as “charge sustaining operation”) the Volt will get 50 miles per gallon. According to the EPA burning one gallon of gasoline yields 19.4 pounds of CO2. That means the CO2 emitted per mile driven while running on gasoline will be 0.39 pounds. How much CO2 will be emitted per mile when the Volt is powered by energy from the electrical grid that has been stored in its battery? That depends on how the energy on the grid is generated. If you live in an area where the power on the grid is generated primarily with coal, then the amount of CO2 per kilowatt-hour generated is fairly high. If you live in an area where the power on the grid is generated primarily from nuclear, then the amount is fairly low. On the average, though, there are 1.34 pounds of CO2 pumped into the atmosphere for every kilowatt-hour of energy generated for the electric power grid in the United States, according to the Department of Energy (2000). The fully charged lithium-ion batteries hold 16 kilowatt-hours of energy and will propel the Volt 40 miles. That works out to 0.4 kilowatt-hours per mile. So that means on the average, 0.54 pounds of CO2 will be put in the atomosphere for every mile that the Volt drives on energy drawn from the electrical grid, assuming perfect charging efficiency. But charging a lithium-ion battery off the grid is not 100% efficient. There are grid transmission losses and grid to battery conversion losses which add up to about 10%. So running your Volt off of electric grid power will yield closer to 0.59 pounds of CO2 for every mile your drive. That is 151% of the CO2 put in the atmosphere by the running the Volt off of gasoline. How many miles per gallon must a conventional automobile get in order to put the same amount of CO2 into the atomsphere per mile as a Chevy Volt does when running off of grid power? That’s easy- about 33 miles per gallon. Here are some cars that will do better. If you drive in an area where the electric grid is primarily powered by coal, then the numbers are even worse. Burning coal to power the electric grid yields about 2.1 pounds of CO2 for every kilowatt-hour generated. Driving your Volt with grid generated power will yield about 0.92 pounds of CO2 for every mile driven (when 10% conversion inefficiencies are added in). That is the same amount of CO2 per mile as a conventional automobile that gets only 21 miles per gallon! So don’t be fooled by astronomical claims of miles per gallon for the Chevy Volt. And if you are worried about CO2 (I’m not), then don’t count of the Chevy Volt to save you – it won’t. There may be a lot of man made obstacles to Salmon survival, such as dams, over-fishing, etc., but sea-level rise is not one of them. Let’s get right down to the nitty-gritty. Salmon have been around for about 500,000 to 1,000,000 years, give or take a few hundred thousand. This is not a praticularly long time, nevertheless, Pacific Salmon diversified into multiple species, including Cherry Salmon, Sockeye Salmon, Chinook Salmon, Pink Salmon, Chum Salmon, and Coho Salmon. There are also Atlantic Salmon and even land-locked Salmon. Yes, that right, the sea level is dropping at almost all locations where it is measured in Alaska. So, it doesn’t look like sea level rise is likely to be much of a threat to the salmon in Alaska or British Columbia. But let’s pretend for a moment that the seas will rise dramatically over the next century, or longer. Would the Salmon survive this dire situation? If the past is any indication, the Salmon should pull through. 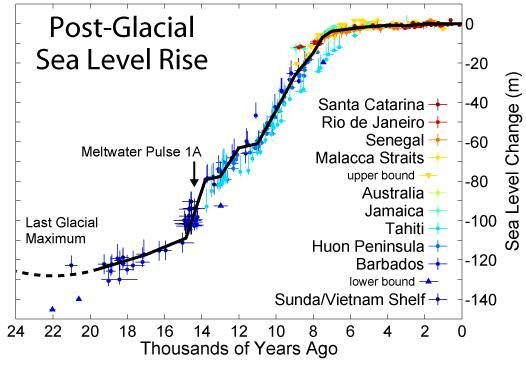 Take a good look at the graph of Holocene sea-level in the graph below. Notice that from about 12,000 14,000 years ago until about 8,000 years ago the sea rose about 120 100 meters. So, the sea level rose about 2 meters per century for 40 60 straight centuries in the recent (geologically speaking) past! But the Salmon somehow survived. What effect did this sea-level rise have on the Salmon’s habitat? The movie below shows Beringia, consisting of the eastern part of Siberia and Alaska from 21,000 years ago to the present. Look what happens from 12,000 years ago to 8,000 years ago. I would judge that as a pretty dramatic change of the Salmon habitat. Yet they seem to have thrived. I think they will survive sea-level rise this century. You are currently browsing the archives for the anthropogenic CO2 category.